20 ml polymeric dropper bottle. Outer package - carton. Rapidly recovers affected pen cover. Successful use in infectious diseases. Prevents of stress and self-deplumation. The drug contains active ingredients (vitamin А - 50,000 IU; vitamin D3 - 25,000 IU; vitamin Е - 30 mg) in physiologically correct proportion. Vitamin А provides normal avian growth and development, regulates metabolism, recovers pen cover, influences over immunity to stress situations, most infectious and noncontagious diseases. Vitamin D3 provides availability of calcium and phosphorus in gastrointestinal tract and increases osseous system stability. Vitamin E provides normal activity of reproductive system and promotes availability of other vitamins. Drug components provide synergistic effect on avian organism presenting metabolism normalization, increase in organism resistance, stimulation of growth, development and producing capacity. For treatment and prevention of hypovitaminosis and associated diseases in pigeons, ornamental and singing birds during molting period in order to reduce it and prevent self-deplumation; in metabolic disorders, ovaritis and salpingitis; to increase palatability, egg-laying capacity and livestock safety; in stress situations and before immunization; to remove stress related to transportation. Not available. In case of skipping of one or several drug doses, proceed the course of use immediately in required doses. 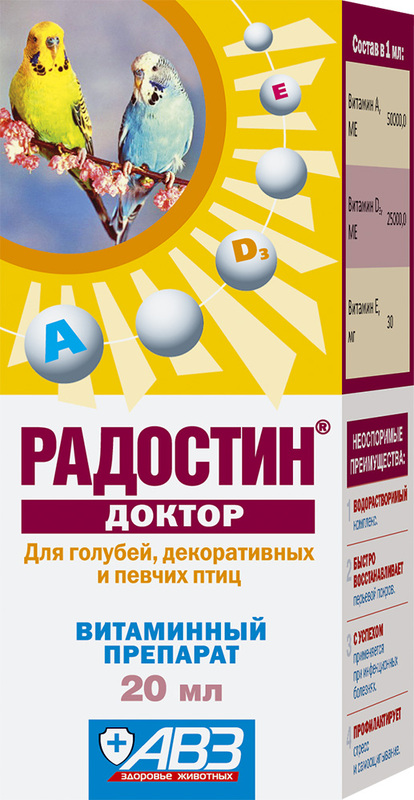 Do not use Radostin Doctor in combination with other vitamin medications. Rear the drug previously dissolved in water (1 ml or 10 drops per 100 ml of water) within 5 days. Repeat the treatment course in 10 days. Prevention: administer the drug in a therapeutic dose within 5 days. Adverse events and complications are not observed in case of administration as per package insert. Store at 0-25°С. Protect from light and moisture. Shelf life is 1 year from manufacturing date.